135. Snider, B. B. 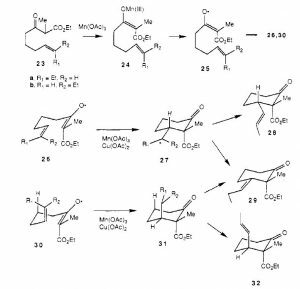 “Carbofunctionalization of Alkenes” Chemtracts: Org. Chem. 1991, 4, 403-419. 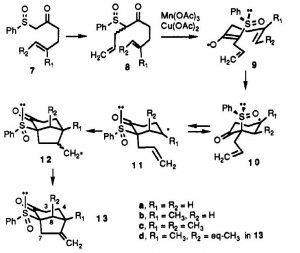 Ethanol complements the typical solvent, acetic acid, for Mn(III)-based oxidative free-radical cyclizations. Ethanol acts as a reducing agent for primary radicals, converting them to alkanes. 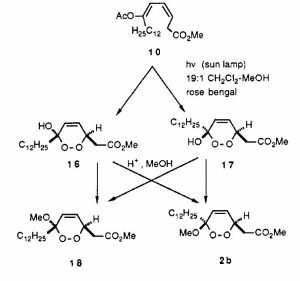 Acetylenes can be used as substrates since the vinyl radicals are reduced to alkenes by ethanol. Finally, a higher percentage of 5-exo cyclization products are obtained in ethanol than in acetic acid. 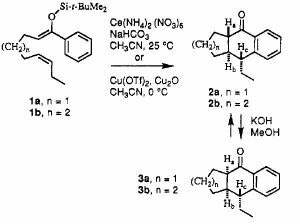 Comparable regio- and stereochemical results were obtained when cyclizations of a series of 2-substituted 3-oxohept-6-enoate (or oct-7-enoate) esters (acetoacetates) were conducted by manganese(II1) acetate oxidation or by iodine or bromine atom transfer cyclization. 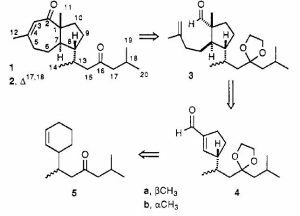 The observed trends support the conclusion that free radicals (rather than Mn(II1)complexed radicals are involved in the Mn(II1)-mediated oxidative cyclization of tertiary malonates and acetoacetates. 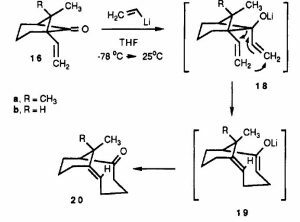 Unsaturated dialkylketenes undergo intramolecular [2 + 2]cycloadditions. Intramolecular cycloadditions of dialkylketenes give higher yields than intramolecular cycloadditions of monoalkylketenes, even though dialkylketenes are less reactive than monoalkylketenes. 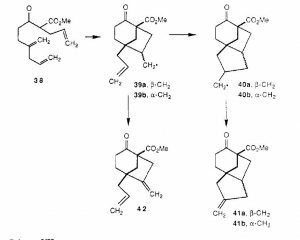 An intramolecular competition experiment with ketene establishes that trans-alkenes are approximately 33 times more reactive than cis-alkenes in intramolecular cycloadditions.